Mauritius is challenged both in terms of food autonomy and the demographics of its agricultural sector. The government plan seeks to reduce the dependency on imports, thereby diminishing loss of currency and CO2 footprint. Furthermore, it seeks to ensure a continuity and economic viability of its agricultural sector, whose backbone is constituted by the small planters. Yet a majority of these are over 50 years of age. It is therefore socially, economically and environmentally vital, that demand and supply of sustainable Fresh Fruit and Vegetables (FFV) be achieved in a way that strengthens this agricultural population and provides inspiring perspectives for the next generation. Sustainability including its economic return is one such theme to turn to for inspiration. Whereas corporate farms may find it easier to adapt to sustainability criteria, the small planters remain the backbone of the sector and must be part of this evolution. Hotels are the cornerstone of tourism in Mauritius, accounting for some 1 million tourist arrivals per year. Whereas tourism produces receipts of over USD$ 1.2 billion, such a tourist influx comes with a substantial environmental footprint, yet it can have strong leverage over patterns of Sustainable Consumption and Production (SCP) for the island. While initiating sustainability practices may be challenging, ultimately it is what makes Mauritius attractive, i.e. a tourism destination with remarkable natural features, and embedded within a stable political and economic climate. All tools provided though this handbook will support hoteliers in Mauritius on their journey towards more sustainable business practices. 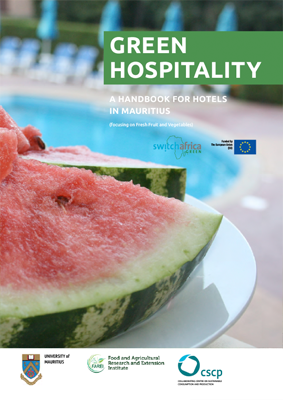 Two volumes of this handbook have been developed, one for retailer companies and a second one for hotels in Mauritius under the SWITCH Africa project “Promoting Sustainable Local Agriculture through Green Retail and Green Hospitality” (SUS-AGRI). The SWITCH Africa Green programme supports 6 countries in Africa to achieve sustainable development by engaging in transition towards an inclusive green economy, based on sustainable consumption and production patterns, while generating growth, creating decent jobs and reducing poverty. This is to be achieved through support to private sector-led inclusive green growth. The overall objective of the SUS-AGRI project is to promote sustainable local food in Mauritius by leveraging the channel power of retail and hotel sectors to drive sustainable food consumption and production, add value to local food and improve livelihood of small holder farmers.